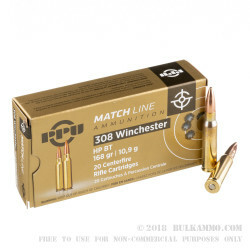 Looking for a great all-purpose hunting round in .308 Winchester? Need instead, a budget match type load for paper punching or final scope sighting in work? 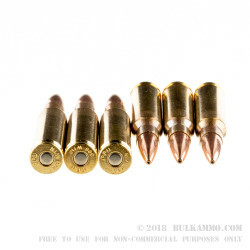 Need a high quality round for a semi auto but don’t want to pay $1.50 a shot? Prvi Partizan had you in mind when it developed and produced this .308 Winchester 168 grain Boat Tail Hollow point MATCH load. Note: this is not a ½ MOA round consistently out of standard military rifles. It is accurate, and it is reliable, but it is not the ultra-match bargain you've been dreaming of. It is purpose built for those individuals that need accuracy, reliability and quality components but don’t need the one hole accuracy that you have to pay the big bucks for. 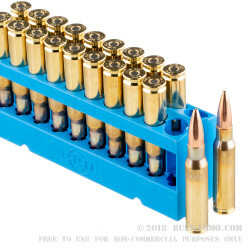 Now: it should be made clear: in the right conditions given the right firearm, this round can easily shoot same hole groupings at reasonable ranges, but it’s called match because of the tolerances, the reliability and the consistency of the load. Not because it is the most accurate round in existence (though it might be for the price). 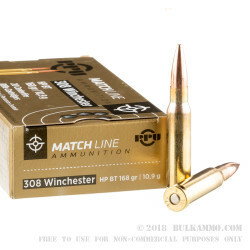 Generally speaking, it is priced at parity to most Mil spec rounds give or take; in relation to that type of ammunition this is a bargain for better accuracy and great performance.